One of my favorite MPB records. I found this record accidentally when digging through the big staples of vinyl from a street merchant in Brazil, it grabbed my attention cause of the cover artwork, but I forgot to listen to – just because he had so much awesome stuff. I remembered the record a few days later, tried to find it again, but without success, I even couldn´t remember the name of the artist. I described the artwork to the guy and he immediately started to lionize about the record. Well, I really wanted that record now, but where the hell was it? We almost searched one hour for it and as we already wanted to give up, I turned my spotlight on another record, Jorge Ben´s “A Tábua De Esmeralda”. Well, I will buy this one, let´s see hows the vinyl condition. And, believe it or not, the Sergio Sampaio record was inside the slipcover behind the Jorge Ben record. Unpossible to see it if just flipping through the record boxes. Finally and the record is a direct hit. 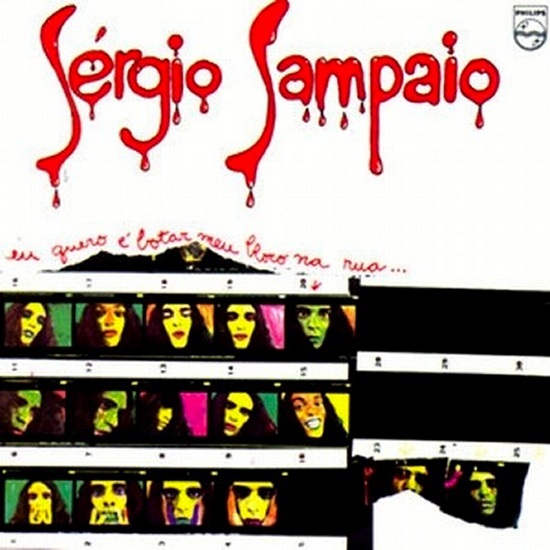 In the late sixties Raul Seixas spotted the talent of Sergio Sampaio and started to work with him. Seixas also produced the first full-length “eu quero é botar…” from 1973, which contains a wide range of musical influences: Blues, Rock´n´Roll, Samba, Choro, to name just a few. The title track already was a big hit in the year before and Sampaio also was part of the legendary Raul Seixas second record “Sociedade da Grã-Ordem Kavernista”. He wrote some of the songs and also sang besides Raul, Edy Star and Miriam Batucada. So the expectations were really high for his debut and almost the whole music press received it with disappointment, it also didn´t sell very good either. Maybe it was the result of his often “difficult” relations with the press, who used to illustrate him as a eccentric person, but maybe he was just a young and inexperienced guy, not used to deal with the vampires from the press. The music definitively is a unique blend of traditionalism with the fever of the rock guitar. The recordings include one of the finest musicians around in Brazil at this time: Ivan “Mamão” Conti (from Azymuth) and Wilson da Neves on drums, Zé Roberto on Piano and Moog. His later release were much better admitted from the press, but Sergio never gained the attention from the public he deserved. Although the title track did play a big role in the cultural revolt of the student movement against the Brazilian military regime. Originally not intended by Sampaio, the students saw their own feelings and experiences reflected in the lyrics. Sergio Sampaio died in May 1994.